This is a warning! Whether you’re already into any kind of creative hobby or not, after a visit to Modulor you might come home with tools and materials you had never thought of buying! The share size of this two-story shop and its inventory are outstanding. You’ll find anything from different paints, pencils and markers, to paper in any kind of form, to leatherworking tools, frames and clay, to things you wouldn’t even know what to use for. That is why many art students and professionals come here to buy their supplies. It is so much fun to just lose an hour and explore everything that Modulor has to offer. 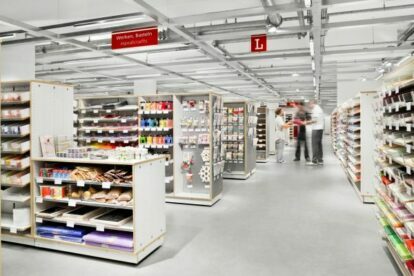 I love to go for a stroll through the aisles, let myself be inspired and come up with new projects! Modulor also offers some “less artsy” products, such as a nice selection of stationery and Washi Tapes. Another product of this range, that I haven’t found at any other Berlin shop so far, is Sugru. This mouldable glue cures into firm rubber overnight and is great for repairing anything. Since I used it to fix my hair dryer, I am hooked on this stuff and keep coming back to Modulor to buy more packets. As you can see, even if you really aren’t into arts and crafts at all, you still might find something interesting here.